Food packaging is as important as the food item it holds inside it. If you want to succeed in the food business, you have to pay closer attention to its packaging. You can look for different packaging companies and hire one to take care of the packaging of your product, but make sure that the quality is good. A good packaging that has good quality will attract more customers and build their trust in your brand. In order to achieve successful food packaging, you have to follow some tips which are given below! Many companies edit out the image of their product on the packaging, and that is fine. There is nothing wrong with making your product look appealing. What is wrong is, to change your product into something that looks unrealistic. When you create expectations, that your product cannot meet, your customer will be disappointed and will not buy from you the next time. When people are buying food, they look for what they need, and nothing else. Unless a packaging design catches the customer’s eye, most of the people will choose between products that fulfill their requirements, and the products they have already tried once. However, most of the food packaging designs make the customer’s choice difficult. For example, a juice packet’s packaging will tell you what kind of juice it is. Is it healthy? Is it for kids or adults? What fruits juice is it? All of these answers are hidden in the packaging of the juice. But when all the products start to look like each other, and the customer cannot differentiate between a kid’s juice and an adult’s juice, s/he will become frustrated. The more clear and distinctive your food packaging will be in conveying what it is, the more likely it is that the customer will buy it. Your product packaging is not there to just attract the customers, but its job is to also protect the food inside it. If your food packaging is pretty, but when it arrives at the shelf, or at the customer’s doorstep, it is not in its original form, the design will not matter. Your food package has to protect the food, so it stays edible. Sustainable food packaging will give a message to your customers that you care about them. The environment we live in is getting destroyed every day because of plastic. In this era, a brand that is eco-friendly seems like a breath of fresh air. You will be playing a role in protecting your planet, and more and more people would be inclined to buy your food. Your packaging needs to be unique as well as simple. Sometimes less is more, and it can keep things sophisticated. Stick to the basics, so your design looks eye-catchy. 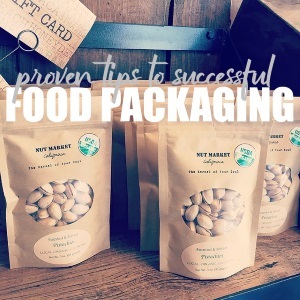 Successful food packaging will take your business to new heights, and these tips will make sure that your food packaging becomes successful! About the Author: Mark Berry is a seasoned designer & creative director with ten years of experience in Chicago, IL. Food Packaging Agency. In his free time, he writes blogs about amazing packaging tips and tricks.